Hey y'all! Everyone and their mothers have already posted a review on the new makeup releases by Milani this February. The stores in my area only received the new lip glosses and matte blushes. So, I assumed that I would not have the pleasure of trying out the other new lip products. 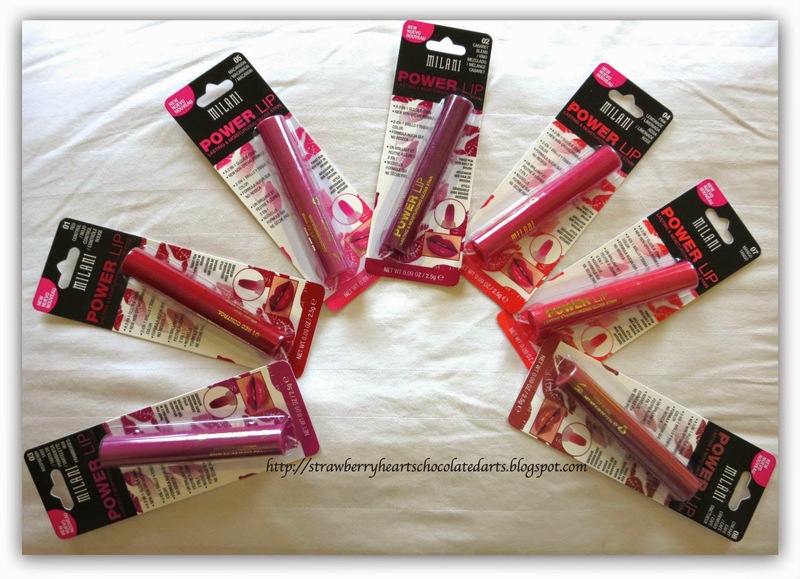 I had to make an unexpected visit home and spotted the Milani Power Lips at the local Walgreens and Meijer stores. By this point though I had heard quite a few reviews, all of which gave me the impression that the Milani Power Lips were good, but not must-haves. As you can tell by the topic of this review, my reservation from buying the Milani Power Lips did not last long. Once I heard that CVS was having a BOGO sale, I asked my Mister Beau to check if the CVS in his area carried all of the new Milani products. Although Mister Beau was not too happy about this request, he cannot seem to say no to me because as soon as he attempts to say no, I pop up in his mind resembling either Bambi or Eyeore. Well, thanks to my Beau I can present this review today. I think I need to come up with a better mysterious term of endearment for him. Mister Beau sounds like a Disney movie character, who wears a tuxedo, carries a cane, and spooks people by popping up out of smoke - a laughing Buddha-magician-jeanie hybrid. Hmm... don't know how or why I come up with such off tangent, verbose introductions. Now, let us get on with our review! 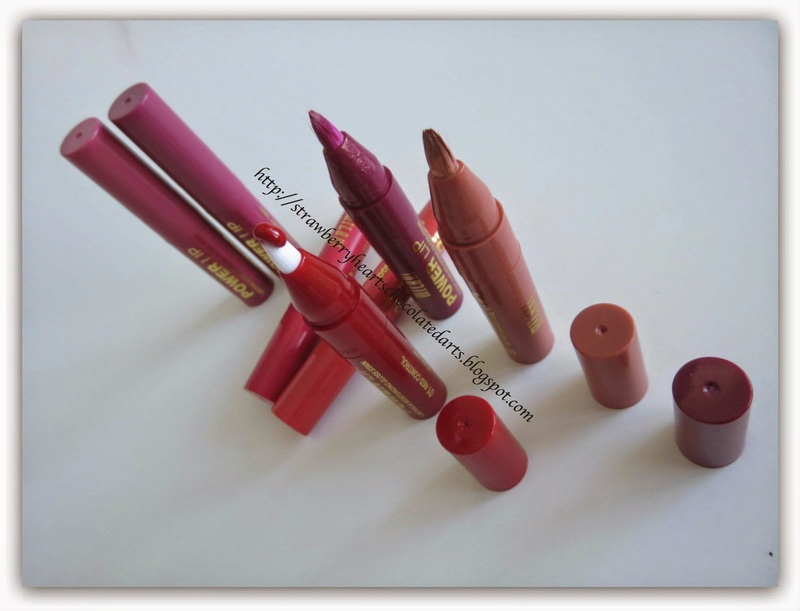 Milani has packaged the Power Lip stains in a protective manner, which makes tampering difficult. I like this method more than the traditional peel off plastic wrapping or seal. However, I am not a fan of the design of the lip color tube itself. The product dispenses out by twisting the area underneath the brush tip applicator. The problem with this mechanism is that I found myself twisting for a while before the product came out and when it did come out, it was too much. It appears that there is not a lot of product to begin with, so obviously I would not want to dispense more than the amount I want to use. Although the wand style - which exposes the product to air and bacteria as you take the wand in and out - may not be as sanitary as the twist up style, I would prefer it more. The shades Raspberry Tart, Red Control, Macaroon, Cabaret Blend, Pink Lemonade, Mango Tango, and Creamy Cafe are displayed from left to right in the picture below. The shades Creamy Cafe, Macaroon, Raspberry Tart, Mango Tango, Pink Lemonade, Red Control, and Cabaret Blend are displayed from left to right in the picture below. Please reference the pictures to get an idea of the shades available. These shades are brighter and lighter (opposite of dull/subdued) than they appear in the following pictures. 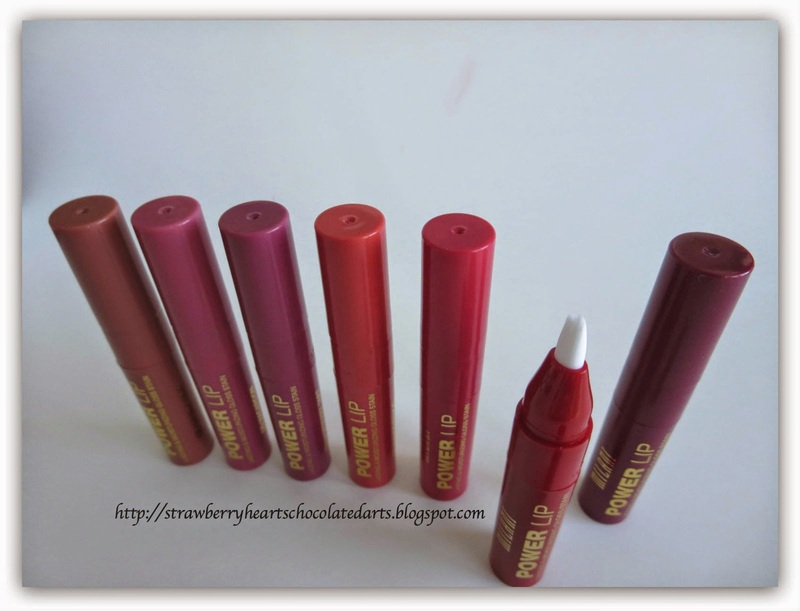 The Milani Power Lip stains are creamy, richly pigmented, and intensely glossy. 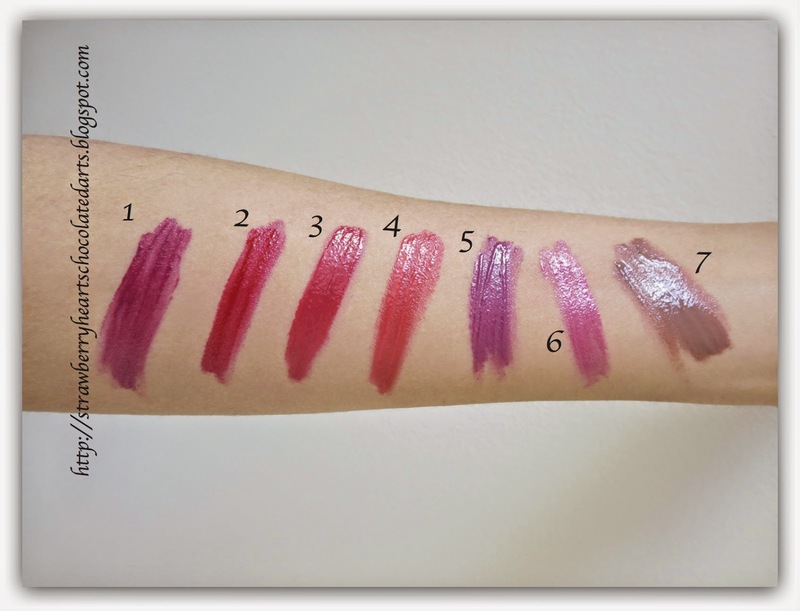 Given that I purchased and kept (i.e., no returns = no regrets) seven of the eight total shades in the collection, my liking of these Power Lip stains is established. I definitely like the concept of a liquid lipstick, but until recently I was not impressed by the formula of any that I have personally tried, with the exception of Shiseido Lacquer Rouge liquid lipsticks. In the past few months, I have tried many liquid lip colors. In fact, it seems like I only gravitate towards liquid lip colors these days. Perhaps this is because I have really enjoyed the formula of the new liquid lip products that I have been experimenting with, including the Milani Power Lip stains. 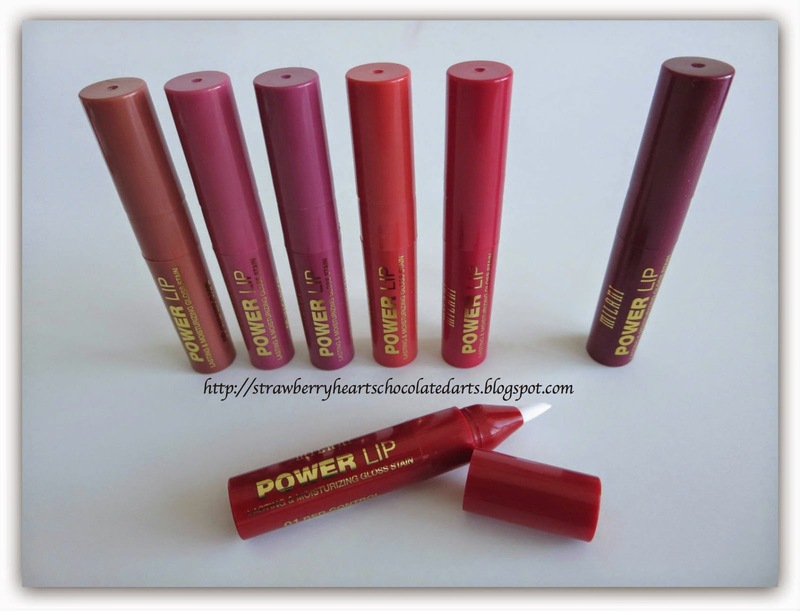 I really like the consistency of the Power Lip stains; the product is neither thick nor thin. If thick, the product is usually difficult to apply and spread the product. If thin, the product is usually sheer, streaky, or patchy. The product here is packed with intense pigment, making one smooth swipe enough. The applicator and easily spreadable formula makes precise and clean application possible. However, most people will want to apply this product carefully, using a mirror, because the high pigmentation can make the application messy. I did not experience / notice a particular taste or scent. The intense glossiness wears off into a subtle sheen. The color wears off into a stain that is not subtle by any means. 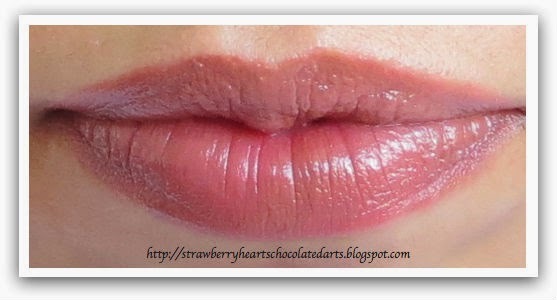 In my opinion, the Power Lip stains have a better than normal (4 hours) staying power. Over the duration of the wear, the shades begin to look brighter and semi-matte (not true matte / not drying). The Power Lips are by no means true stains, but very impressive nevertheless. I would not like wearing a true stain anyway. 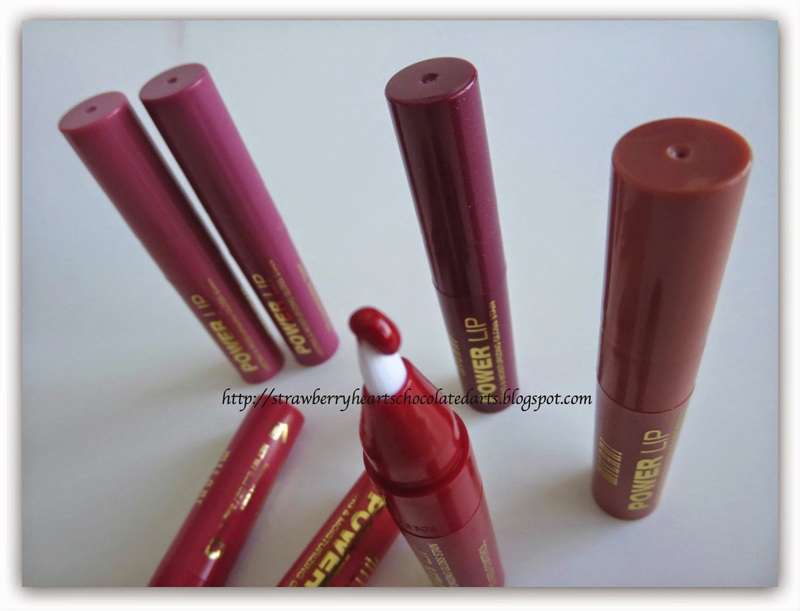 Overall, I am very fond of the Milani Power Lip stains and considered buying backups. If I had to gift or recommend an affordable liquid lipstick, I would choose Milani Power Lip stains. 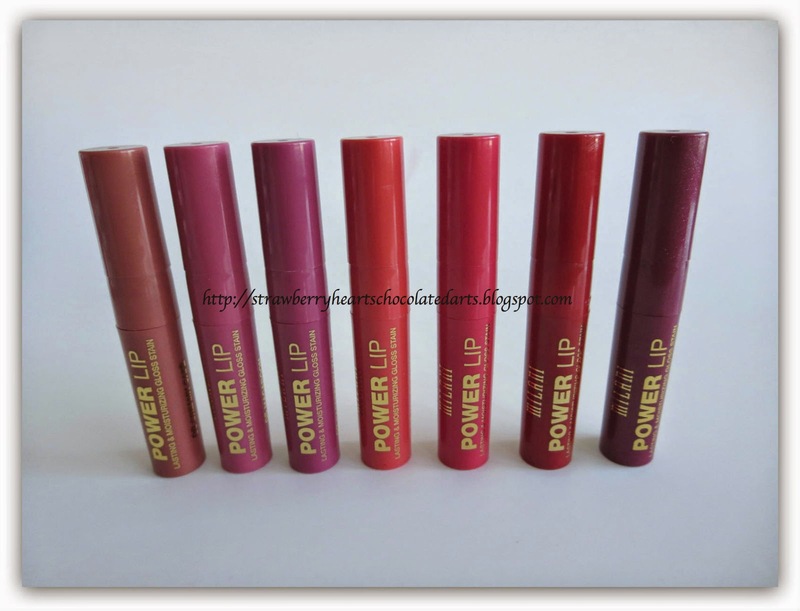 The L'Oreal Extraordinaire Liquid Lipsticks, Maybelline Color Elixirs, and NYX Butter Glosses are all nice products, but the Milani Power Lip stains deserve first-place. Nice review! 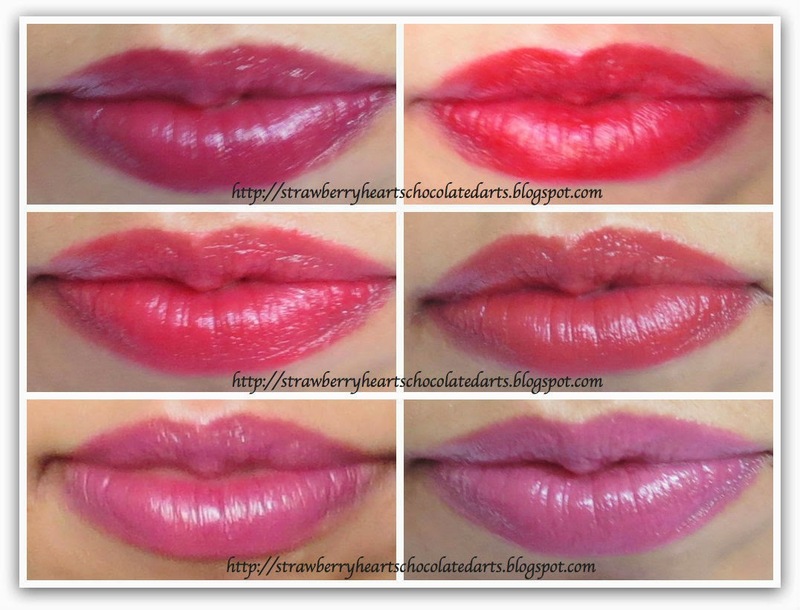 These lip stains are very pigmented, thanks for sharing! Poor Mister Beau! I tell my boyfriend to do the same thing, and he gets so annoyed! Haha! It's a girls thing! The colors look absolutely stunning on your lips by the way! I only have Pink Lemonade, but I may go to the store and get Creamy Cafe! So pretty! Wow these look hyper pigmented.. Nice shades as well. Wish we got tem here! Well, I trust you the most, so as soon as I run across these, I will pick some up! All of them look gorgeous on you! Even the one I (think) you didn't keep :) Great review. And btw, I love your verbose intros!